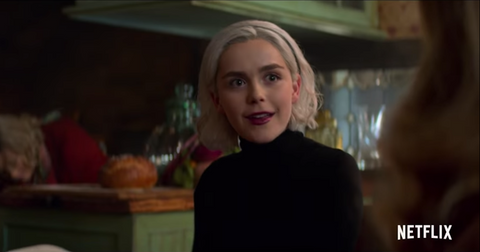 Whether you've been a longtime fan of Sabrina via the comic books and the '90s show — or just recently joined the coven thanks to Netflix's new Chilling Adventures of Sabrina — we bet you can't wait for Season 2 (OK, technically Part 2) to drop on April 5. 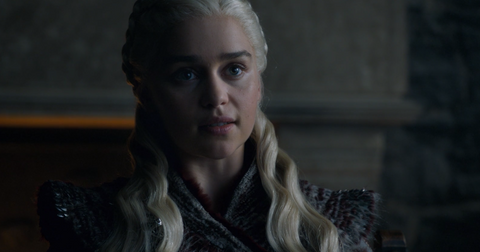 And what better way to indulge your anticipation than by reading elaborate theories about what fans predict will happen in this second season? Will Sabrina have to leave the mortal world — and with it, her BFFs and boyfriend, Harvey — entirely, now that she's signed the Book of the Beast? Will we ever hear Salem talk like in the show? 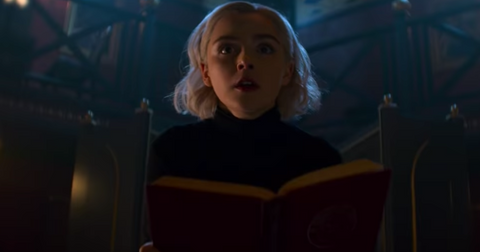 Keep reading for the answers to those questions and for what we think is going to happen in Part 2 of the Chilling Adventures of Sabrina. 1. Sabrina isn't actually going to leave the mortal world. At the end of last season, we saw Sabrina sign the Book of the Beast in order to save her mortal friends. Signing the book makes her a full-blown witch, and we know from the show that full witches have to sever all ties with the mortal world. 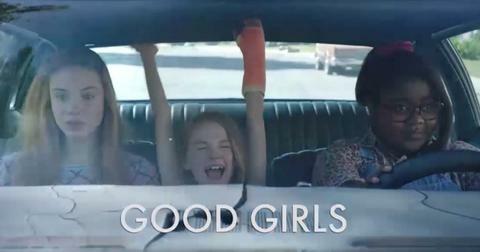 So will Sabrina have to leave her besties Susie and Roz, and her boyfriend Harvey? Probably not, based on what expert sleuths on reddit have to say. 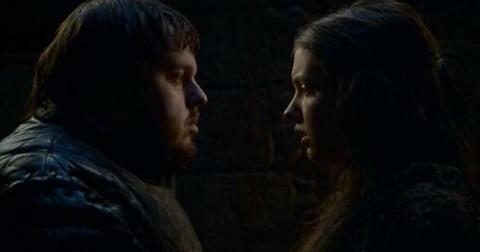 First, the teaser shows her mortal friends play a big role in this season. But also, Michelle Gomez, who plays Madam Satan on the show, hinted that Sabrina would be staying at Baxter High in an Instagram photo she posted in late February. Michelle remains one of the only cast members to post a behind-the-scenes picture from the second season, and from the looks of the photo, it seems like the two are putting on a school play. The setting and stage seems much more likely to be something happening at Baxter High than at the Academy of Unseen Arts, so we expect Sabrina is going to continue to navigate life in the mortal world, despite having become a full witch. If you didn't get your full werewolf fix in The Order, The Chilling Adventures of Sabrina might be able to remedy that. Remember Dr. Cerberus, the owner of the local bookstore, who recently hired Hilda to work at his store? We started to see their relationship blossom, but although everyone assumes he is a mortal, we think there might be more to that story than meets the eye. 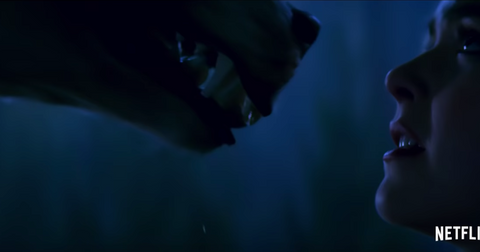 Given his creepiness, uncannily bright eyes at the end of the season, and the way the camera panned to a full moon and to Sabrina coming face to face with a wolf-looking creature in the teaser, we're kind of thinking we're on the right path. And that means that if Dr. Cerberus is a werewolf, there might be others on the prowl this coming season. 3. Harvey is probably going to die. Fans of the comic books know that Harvey dies pretty early on. He gets eaten by cannibal witches, comes back as a zombie who eats his parents, then gets killed again and comes back in the body of Sabrina's creepy dad Edward. 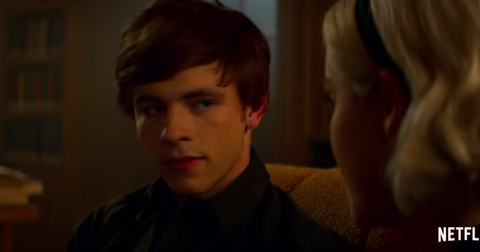 Naturally, Netflix didn't want to kill off heartthrob Ross Lynch so early on, but considering Season 2 is supposed to take a turn for the darker, it doesn't seem like a totally unlikely fate for his character. Perhaps he'll even die at the hands of a werewolf? Whatever his cause of death, we're thinking that Harvey should probably be extra attentive and watch his back this season. 4. 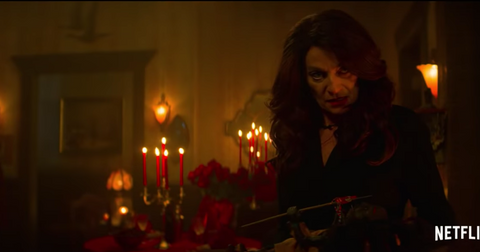 We'll finally learn what Mrs. Wardwell (AKA Madam Satan) has been hiding. There are two new additions to Season 2's cast of characters — one is Dorian Gray, who we expect might follow a similar trajectory to Oscar Wilde's eponymous character of the same name — and the other is Adam Masters, played by Alexis Denisof. According to Deadline's description of his character, Adam is Mary Wardwell's "handsome and charming" fiancé who "returns to Greendale after a stint overseas working with Physicians Without Frontiers." He doesn't yet know that Mrs. Wardwell has been taken over by the demoness Madam Satan, and is stunned to find his loved one isn't the same person she used to be. 5. Adam Masters is going to play a critical role this season. Die-hard Sabrina stans know that Part 2 of the comic book centers around the mysterious return of Edward Spellman, Sabrina's dad. But fans suspect that the show, which often strays very far from the comics, will borrow bits and pieces from the original storyline and mirror Edward's character in Adam, who is also returning to Greendale after having spent a long time away. Instead of Edward returning to Greendale to find out who has made his daughter such a powerful witch like in the comic, we expect the show is going to focus on Adam's return and subsequent quest to find out how his future wife became possessed and what she's been hiding since he's been away. 6. We might hear Salem speak. 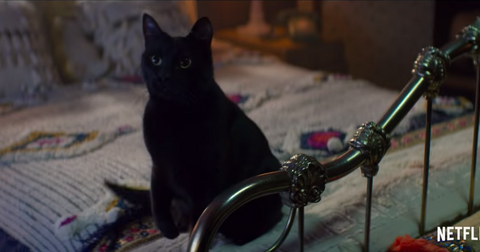 One thing we definitely miss from Sabrina the Teenage Witch, the Friday evening comedy from our tween years, was the way that Salem, Sabrina's talking cat and BFF, always had hilarious commentary to sprinkle in throughout the show. For the first season of the Netflix show, however, creator Robert Aguirre-Sacasa decided against having him speak. "It felt like if you have a talking cat, it would almost inherently be funny and be a comedy," he said in an interview with IndieWire. 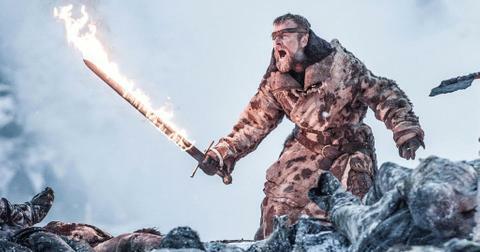 However, that doesn't necessarily mean he won't have a few interjections in Season 2. "That isn't to say that Salem won't talk in the future," he went on to say. Don't miss The Chilling Adventures of Sabrina when Part 2 arrives on Netflix, April 5.